The St. John Shade Project outfitted truck ready to begin delivering shade across the island. The U.S. Virgin Islands is a beautiful land with wonderful people, working to put their community, businesses, and lives back together after the twin blows from Hurricanes Irma and Maria. 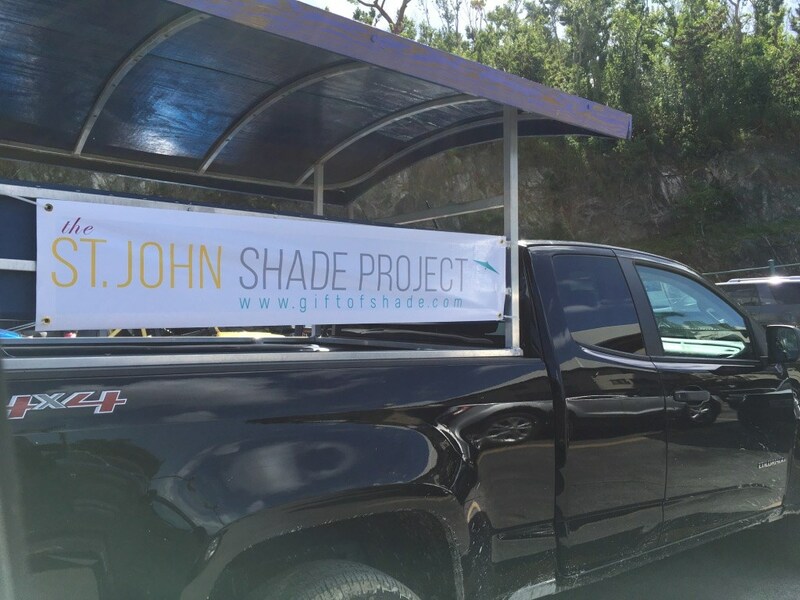 The St. John Shade Project is an effort of ShadeScapes Americas, to help in the Herculean effort facing USVI. For the past four days our team has been getting everything in place for installing the “gift of shade” at over twenty locations around St. John. Installation starts today with umbrellas going up at Indigo’s and Pickles in Paradise. A small island with a year-round population around 5,000 the challenges facing the people here are significant. Logistics are complicated, communications is sporadic. But the St. Johnians are resilient, upbeat, and working hard to get things back on track. We’ll be posting throughout the week, with some of the stories of the businesses we are partnering with, and the amazing volunteers and others pitching in to help, to get their businesses back on line, and to welcome back the many visitors that love Love City. St. John is coming back and we are honored to be a small part in it. St. John and the U.S. Virgin Islands sit in the Atlantic about 900 miles east of Florida. Just getting there is a bit of an adventure. Thankful to the St. John Shade Project volunteers and helpers! Shade brings us together. St. John Shade Project couldn’t provide the “gift of shade” if not for the many wonderful and supportive members of the St. John community! Special shout out to Penn Trucking! St. John Shade Project wouldn’t be getting the work done without their tremendous assist! On Thursday Penn Trucking made our Coral Bay Delivery Day a big success.